I met Randolph Langenbach at the Natural Building Colloquium in New Mexico a few weeks ago, and was in the audience when this video was being recorded. Randolph has taken the original footage and enhanced it with many extra images, so that it is really better than it was the first time. I think the research he has done as an architect and historic preservationist that you will see in this video is important, ground breaking work. He recently returned from Nepal where he was being filmed for a NOVA documentary about earthquake resilient reconstruction in that country. 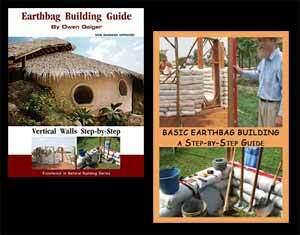 I believe that the techniques presented here have much broader application with earthbag building and elsewhere. See www.traditional-is-modern.net for more about this. It would be helpful to know what type of metal mesh they used. I made a compost bin out of similar looking mesh and it rusted out in 1-2 years in Thailand. The mesh was in contact with the ground and exposed to the rain, but still it surprised me how fast it deteriorated. Also, how will the mesh be protected? Over all, I see ideas like this very helpful. It’s not as strong as earthbag structures made with 2′ buttresses, concrete bond beams, vertical rebar pinning, etc. but the need for safe buildings is so great in Nepal and the budget/time/location constraints so severe that many different reinforcement methods are needed. It has occurred to me that this gabion band technique could effectively replace the conventional reinforced concrete bond beam at the top of an earthbag wall, in situations where concrete and rebar are difficult to access. Also, his suggestion that geogrid material be used, is really quite close to the use of mesh tubing for hyperadobe construction, and in this case the gabion bands would occur on every course, and possibly be the strongest way to build a wall. Furthermore, according to Parshu, the Nepali I met at the NBC, soil for filling bags is much easier and cheaper to access than stones in many places. Heavy duty geogrid material would likely be stronger and more durable than metal mesh that comes in rolls as shown in the video. And good point about describing earthbag tubing as an entire wall of gabion bands. If two gabion bands add strength as most would agree, why not use more? In other words, the proposed gabian bands are a partial, natural step toward earthbag building. Add buttressing, etc. as we advise for even greater strength and safety. Side note: Some good news for Nepal. The highway to China that was wiped out by the earthquakes has been reopened. Many goods come from China, so this should make buying building supplies much easier and hopefully more affordable.